Currently, we only employ a cookie for more accurate traffic analysis such as tracking the time/date of the visit, the page viewed and the referring website. This cookie retains some form submission details. The data that we do collect is never stored in any individual website tracking profile and only serves to update aggregate counts allowing us to monitor site traffic. We may share non-personal, anonymous information collected through cookies with third parties. Most browsers are initially set up to accept cookies. If you would prefer, you can set your browser to reject cookies. 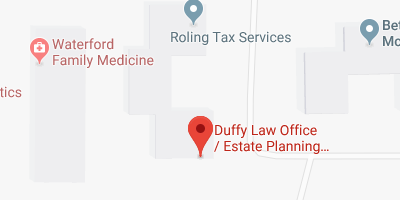 Should you have any further questions regarding our privacy policies and procedures, please feel free to call our office at 563-445-7400, or email us at info@duffylawoffice.com.